Jeanette Reynolds Elder, age 92 of Pikeville, Kentucky passed away May 20, 2018 at her home. She was a retired school teacher from the Pikeville Independent School System where she taught high school math until 1976. Her leadership with the Pikeville cheerleaders and the Kentucky Organization of Pep Organization Sponsors (KAPOS) led to her induction into the PHS Cheerleader Hall of Fame, the PHS Athletic Hall of Fame, the Dawahare’s KHSAA Hall of Fame, the Pikeville College Honorary Hall of Fame, and receipt of the Gene Davis ESPY Lifetime Achievement Award. 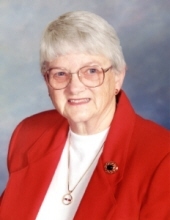 In addition, she served 26 years as a volunteer at the Pikeville Medical Center, and was a faithful member of the Pikeville UMC Choir for over 60 years. Jeanette was born in Lake Worth, Florida on October 16, 1925, the daughter of the late Marie Dexter and James M. Reynolds. Along with her parents, she was preceded in death by her husband of 49 years, Edward Leslie Elder, and one sister, Dorothy Reynolds Neeley. She is survived by four children: Lesley Elder Cunningham (Bobby) of Pikeville, Kentucky, Betsy Elder Weiner (Jeff Gordon) of Brentwood, Tennessee, James Edward Elder (Audrey) of Cincinnati, Ohio, and David Douglas Elder of Lexington, Kentucky. She is also survived by seven grandchildren, Brian Edward Weiner (Ashley), Lauren Marie Elder Gassier (David), Jonathan Lee Elder , Michael Lee Weiner (Melissa), Christopher Leslie Cunningham, Jessica Ann Elder, and Nicholas James Elder; and six great grandchildren, Ethan James Weiner, Allison Elizabeth Weiner, Carson Christopher Cunningham, Kaya Faye Gonzalez-Elder, Léo Patrick Gassier, and Katherine Marie Weiner. To send flowers or a remembrance gift to the family of Jeanette Reynolds Elder, please visit our Tribute Store. With Brad Smart officiating. In lieu of flowers please make contributions in Jeanette’s memory to either the Pikeville United Methodist Church or Pikeville United Methodist Women, P.O. Box 311, Pikeville, KY 41501 or to the 15th Region KAPOS Jeanette Elder Scholarship in care of Jeannie Stone, 122 West Keyser Heights, Pikeville, KY 41501. "Email Address" would like to share the life celebration of Jeanette Reynolds Elder. Click on the "link" to go to share a favorite memory or leave a condolence message for the family.